As human beings, God created us with very strong emotions. Some more than others, but sometimes when hurt and pain enter our lives, we can push those emotions down and should be able to turn them off like an ostrich who his head in the sand. If I can't see it, then it did not happen......If I can't see it, then I am not responsible for my actions when I hurt someone, If I can't see it, then I don't have to deal with it! Once again, these are all lies of Satan that are used to tear us up internally and eventually externally as well. I have always been a very trusting and loving person. However one day over 29 years ago, my trusting nature took a detour. At the age of 17/turned 18 a month later, I had a beautiful baby boy! Chris and I lived in a townhouse that was.......well, kind of a dump.....but it was our dump to live in! One evening, I saw this HUGE spider and it ducked behind the sofa. Now I have an incredible fear of spiders! The next morning, I was so afraid of running into this spider that I had seen and trembled in fear. It was in the summer so it was very, very hot. I had on a pair of shorts (mind you, I have never worn short shorts in my life! ), t-shirt, and a tall pair of cowgirl boots! I was not gonna let that sucker climb on my foot! I put Bubbas swing on the front porch and let him swing in the breeze that gently blew that morning. I had the door open, a big ole broom, and was pulling the sofa out to try and kill that sucker! My next door neighbors daughter popped over and started to help me look. She was about 8 years old, and was staying at home with her granddaddy that day while her parents were out for a while. Her granddaddy was a pastor and he and his wife were visiting for a few days. Very nice people....so there were absolutely no red or yellow flags popping up for me. He came over and tried to help us find this spider. Mind you, my den was not much bigger than a small bedroom, so it was not like there was a whole lot of area to look over. As I was looking, I said that I had to go check on the clothes on the line in the back. His granddaughter was playing with Bubba on the stoop so they said to go ahead and check them. As I walked into the kitchen, he stopped me and told me to leave my back door unlocked, he had a surprise. A tiny yellow flag popped up because it just seemed so strange, but my incredibly trusting nature said, "He is a Pastor, I am sure there is nothing to it!". Now, I am not completely stupid.....as soon as I came back in a few minutes later......I LOCKED my back door! We went back to spider looking for a little while and his granddaughter had to run back home for something. (Just so you know.....her granddad was a pastor, husband, father and grandfather......perfectly trustworthy!) When she went into her door he ran over to me, tightly wrapped his arms around me and started trying to kiss me!!!! If you know me, I have always been VERY strong, but the way he had me wrapped up, I could not get loose and he was VERY strong for a 60 something year old man! He kept begging me to kiss him as I would turn my head and fight to get loose. I told him I was married and he told me, "So what.....I am married too!"! By this point I was in total and utter shock! In a few minutes his granddaughter ran back out of her house and was coming to mine so he let go, jumped back, and acted as if he were looking for the spider. My whole body was shaking at this point. What was I to do? This was my neighbors DAD! I made an excuse to leave my house telling them I had to go pick up my sisters to come swim, and as I was hurrying to put Bubba in the car and drive off.......he looked at me and mouthed that he loved me. I was fighting back tears of horror because I did not want his poor granddaughter to know what had happened! To make a long story short, we called my neighbor who was a police officer to ask him what we should do. My dad took me to fill out a police report, he was arrested, and we then helped bail him out of jail. In between these events there were some key issues for me. First.......I was horrified that my neighbor would hate me forever for having her dad arrested. Second.....as we filed the report the one question that ate at my soul was them asking me what I was wearing when this happened...indicating that it may have been my fault because of my clothing choice! Third.......my sense of trust had been so violated that I found myself not trusting even the most trustWORTY of men! Now, what did GOD do in this process? First......my neighbor who I thought would hate me.......thanked me! They had been scared of him and his behaviors and they knew this would force the family to face the issues and get help! His other daughter had been sleeping with her door locked at night for fear her dad would come in! Second........we were able to help this family get him out on bond so that they could then go back home and face the issues in both life.....and in court! Third.......I learned that not everyone deserves trust and that God has given us discernment that we MUST listen to! Emotionally, I had become somewhat of an internal basket case for a while. I had the love of family and friends.......and most of all......God to help pull me through and eventually begin to trust again.....but trust with wisdom! The trauma to my emotional state pales in comparison to what some people go through......but it was still a life changing emotional event in my life. For some, the trauma is more than they can handle or face. I am so thankful for Mercy Ministries because they take in young women who have been so emotionally, physically, and mentally abused that they can't find their way out! For us, Mercy Ministries was a total gift from God as they helped put Chelseas broken emotional puzzle back together again through the teachings of Jesus......and the leading of the Holy Spirit! If you know of any young woman who is living a life in Emotional Hell, please direct them to Mercy so they can see for themselves that Emotional Freedom is theirs for the taking! Mercy has a long standing track record for helping young women find freedom.......GODS WAY!!!!! Thank you for taking the time to learn about what God can and will do, and for sharing this information with others that God might be glorified! For without HIM........we can never fully be free! May God bless you!!!!! Today is the very first day of April.....(I actually started this on April first.....but I am just now ..but this is no April Fools joke! Forgiveness is one of lifes requirements to living a full and fulfilled life! Forgiveness.......well, my friends......it is a choice. Forgiveness is an extremely important choice! In my life I have had many hurts and heartaches. Some were from my own doing, and some were just because of differences with others. There will be many times in our lives that we will be hurt for NO apparent reason by those we love......and sometimes by those we do not even know, who think they know us. I am the kind of person who loves very deeply and I feel rejection and hurt equally as deeply. I would love to tell you that forgiveness is easy and that I have perfected it.......but the truth is, I am still having to work on it and probably will til the day I die. I have an extreme sense of right and wrong, fair and unfair, but as my parents taught me growing up.......God never promised us life would be fair. This is where I struggle the most. When I feel as if an injustice has been done I have a really hard time getting over it. I will think that I have it licked.....and then something else happens and everything floods back in. When I was listening to the radio yesterday, I heard a very interesting point. Only GOD has the ability to forget. Well, that helped explain a lot for me. What I need to work on now is not forgetting, but understanding that I am the one responsible for letting go of the hurt even if it continues on. I am the one who continues to hurt myself by going over the perceived injustice in my mind. No one is perfect, especially me, but I am responsible for me and my actions and only me........they are responsible for their actions.....not me......and we ALL are accountable to GOD! I want to share with you the name of the person I find hardest to forgive.........but before I do I want you to know what her crimes are. This person is so hard on me! She sees me and sees someone who is way to large in stature.........she sees my every flaw........she sees someone who is often judgmental and angry because of circumstances I get myself into..........there are times that she loathes me and can't stand to see me! I see this person and I just want to run..........I want to escape her presence! The probl em is I can't. No matter where I go........she is always there! You see.........I see her ALL the time.........in the mirror! The name of this person is Lorraine Elisabeth Stacy........this person is me. Oh my God my God........please forgive me for not forgiving myself! Oh how many times have I taken responsibility for the actions of others and blamed myself as if I had caused them to do what they have done! I want to give you an example of one such incident that haunted me for so many years. When Chelsea was dealing with anorexia, I felt like it was all my fault. Whether it was spoken or unspoken, it was obvious that my size had a lot to do with it. After all, my size was what she was afraid of happening to her. I took on this blame.......I hated myself because I was the reason my daughter was dying. In reality though.......it was not my fault. When everything started with Chelsea, it started with OCD.......not anorexia. Anorexia is what her OCD morphed into since she found it was something she could control and in that control, many of the night and daymares she was having.......disappeared. I had to remember this and know that even though my size was something she did not want to get to.......it was not because of me that it started. It took me a couple of years to realize this and to forgive myself for what I felt I was responsible for. This may not make much sense to those who were not there during the process.........but to me......it has been a long journey to realizing I can only be responsible for my and my actions. You see, Satan wants all of us to feel defeated........feel like a failure......he wants to steal our lives from us, kill us, and destroy us! BUT GOD!!!!!! God has transformed me in many, many ways! He has transformed Chelsea in amazing ways! Had it not been for Mercy Ministries, I am not sure how long it would have taken us to learn this valuable lesson! Now I have forgiven myself and I am trying so hard to forgive others as well. Forgiveness is KEY! The Bible is very clear that if we cannot forgive, then God cannot forgive us! That is sobering! Again, just so we are clear........forgiveness is an action and it is not an option! The forgiveness you need to give, may be something you need to give to someone else.....or it may be that you must first forgive yourself! I implore you to let go of those things that hold you back from Gods perfect Will! Seek Gods face and He will help you do what you need to do! If you have any question.......please let me know! If you need to find Mercy Ministries to help get your life on track.....I will do all I can to help you get all of the information you need! May God bless you all, and please know........Forgiveness may be something you need to practice weekly, daily, hourly or even minute by minute.......BUT GOD.......can help you find what you need to find......when you need to find it! May God bless you all with the life changing attitude of forgiveness!!!!! Life is a daily series of choices. "Do I want a shake for breakfast....or cereal?" "Which shoes should I wear?" "Do I really need this new dress......or should I wait?" These are a few of the somewhat simple choices in a day. Every day we are bombarded with hundreds of choices to make from the menial, to the life changing. A life changing choice for me was, "Oh Lord my God, I am unmarried, pregnant, and only 17.....what do you want me to do?" This was not only life changing........but it was life altering! Just so you know.....in case you don't know, after prayer and much reflection.......Chris and I got married 4 days after we found out I was pregnant and we have been blessed by God for listening to His voice with a 30 year marriage, 3 children and 4 grandchildren and counting! There is not one day that will go by that you won't have to make a plethora of choices! Over 7 years ago, my husband Chris and I had to make one of the most difficult choices we have ever had to make. Our youngest daughter (12 years old at the time) was dying from anorexia and we made the choice to send her very far away from home to try to help her get better. She did get better for a while.......but quickly relapsed. After 2 years of unsuccessful treatment at various facilities and counseling programs, we seemed to have no hope left to be found.......she had to make the choice to live or to die. We were presented with the option of her going to a place called Mercy Ministries, but it had to be HER decision! Thank God she decided to try and go....even though she really did it out of a bit of rebellion to "Show Us!" One of the greatest lessons she learned was that she had to learn to choose whether she was going to believe the LIES of Satan, or the TRUTH of God! She had to learn to discern whose voice she was listening to and then CHOOSE whose voice she was going to believe. 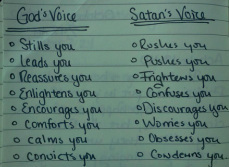 I found this picture on FB that gives great instruction on how to distinguish Gods voice from Satans........and how true it is! Now it is your turn.........what are you going to choose? Will you choose TRUTH........or a lie? Will you choose LIFE.......or death? Will you choose JOY.........or will you choose sadness? It seems so simple......of course I choose truth........or do I? When I hear, "Lorri, you look so beautiful today!" My instant thought is, "Who are you looking at because it can't be me! I am way to fat to be beautiful!" What did I choose to believe? My encouragement to you today is to sit and really reflect on the choices you face everyday. Be prepared to know what you are going to believe........recognize where it is coming from........God, or Satan? Joyce Meyer has a book called THE BATTLEFIELD OF THE MIND. This book was absolutely life changing for me! The battle in my mind was more than I could handle at one point in my life. I did not recognize the lies from the truth........if anything, I was choosing to believe the lies AS truth. Satan wants your mind........he wants your body.......he wants your soul and he is willing to do whatever he has to do to get it! Get your armor ready........know who you are in Christ........and CHOOSE LIFE IN HIM!!!!!!!! If you are having trouble believing truth........I implore you to go to a man or woman of God, go to your pastor, go to someone you know has been there and come out on the other side, and get wise, godly council! If you are a young woman and just can't seem to find the truth and are dealing with issues that have overtaken you like Chelseas did.......I hope you will follow the link below and contact Mercy Ministries! But for the grace of God and His leading us to Mercy......I am fully aware that our baby girl would probably no longer be with us! May God bless you, and make you infinitely aware of the choices you make each day! 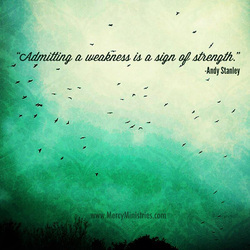 I am excited to share with you some resources made available by Mercy Ministries! These are FREE e-books that they are sharing to help those who may need this life saving information! I am so thankful for their giving, loving, and God fearing hearts! Please feel free to share these with anybody who needs them! You will have a choice to buy the hard copy, or read on down and there is a downloadable version for free. May God bless you as you read these books! 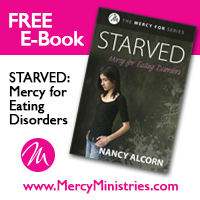 If you or someone you know is struggling with an eating disorder, download this free e-book from Mercy Ministries. 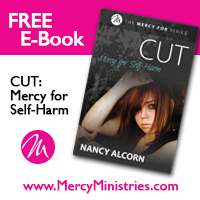 If you or someone you know is struggling with self-harm, download this free e-book from Mercy Ministries. 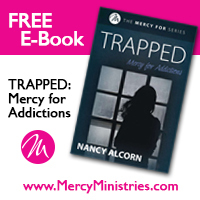 If you or someone you know is struggling with addiction, download this free e-book from Mercy Ministries. If you or someone you know is struggling with the wounds of sexual abuse, download this free e-book from Mercy Ministries. If you or someone you know is struggling with issues like eating disorders, addiction, abuse or self-harm, there are free downloadable e-books available from Mercy Ministries. For the Love of MERCY! Some of us who blog....and do so about Mercy Ministries.....are starting a new project. Every month there will be a theme that we will incorporate in our blog. I have created this page specifically for any blogging I do about Mercy. Mercy holds a huge part of my heart and I am thankful that I was included in this project! For this first posting, I am including the article she wrote as an example, as I work on asking God how I can do this and bring HIM glory! Please, if you have any questions......feel free to write me, or to contact Mercy if you need help, or know someone who does! Who can argue with the beauty of the butterfly? Even if you think they’re cheesy as a decoration, in real life most people think they’re pretty unique and fascinating. Beyond the beautifully colored wings, you can’t help but be amazed when you think of the radical change that happened during metamorphosis from their caterpillar state. In fact, I don’t think I’ve ever looked at a butterfly with disgust over its former classification as a larva. All I can see is what is before me… a graceful and brilliant creature fluttering about. Have you ever met someone who seems like a brand new creation after putting their faith in Christ? It’s amazing to see! Those who were once hopeless, addicted, and tormented by pain actually become peaceful, sober, fruitful, and hopeful as they grow in their understanding of who God made them to be. As most of you know, this is what we were blessed to see first hand with our daughter Chelsea. Satan had worked hard to destroy her. He stole a good portion of her youth for just over 4 years due to anorexia......very severe anorexia! So severe......Satan almost took her life while destroying everything that defined our daughter as we knew her. Through many in-patient and out-patient treatments, nothing seemed to help long term. At the point that Chelseas Dr. told us there was truly nothing more they could do in out-patient care and insurance would not pay for in-patient care because they said she was not under 15 BMI. We were lost and floundering not knowing what to do.........BUT GOD! Her Dr. told us about Mercy Ministries and this truly was our last hope. Six months after we applied......she walked through the doors of Mercy and found new life in Christ and healing! Although she was a Christian.....the voices of doubt and pain had overtaken her thoughts and actions. Mercy gave her the tools she needed to find the TRUTH that Christ had right in front of her! Five months after walking through the doors, she graduated on her 15th Birthday a changed young woman. She had become a New Creation in Christ! It still took hard work, for after a Butterfly emerges, his wings are still wet and need to dry and become strong. Fast forward five years......Chelsea is now 19, living in victory, and attending Toccoa Falls College getting her degree in Christian Counseling/Psychology! God has restored her and is filling her life with blessings overflowing! Chelsea is but one of the thousands of girls who have been transformed by Mercy Ministries. They may come in broken, abused, and empty. The staff at Mercy Ministries will wrap their arms around them and love them anyway, because they see what these young women can become. They look past the larva-- into the future, to see a butterfly. They see these girls the way God does. The transformation made possible through a relationship with Christ is nothing short of amazing. Old things can pass away… all things can be made new.